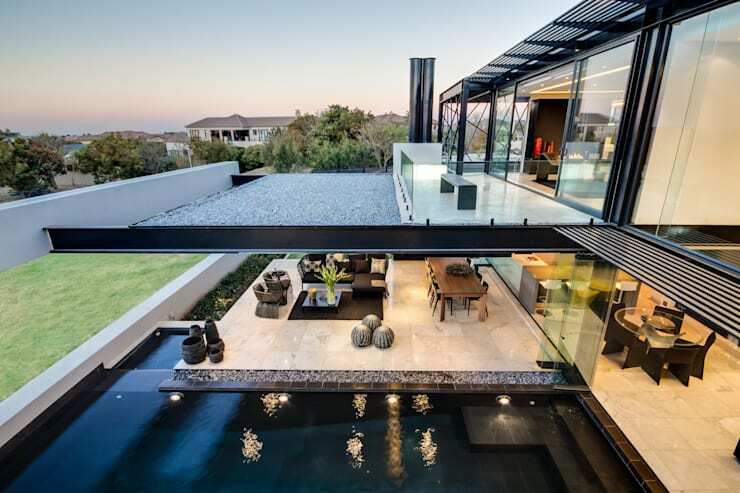 We are going to travel all the way to South Africa today to bring you a modern, savvy and sophisticated home that until now, you probably only ever dreamed of! Designed by talented professionals Meulen Architects, this home proves that living a life of luxury can be incredibly satisfying. As we explore this home little by little, you will also see how its possible for extraordinary architecture, innovative design and spot-on functionality to come together to create the perfect balance. From the outside, we can see just how magical and enchanting this home is. The architecture spreads over an expansive property and it is two-storeys high. The white and black facade is striking and subtle all at the same time. 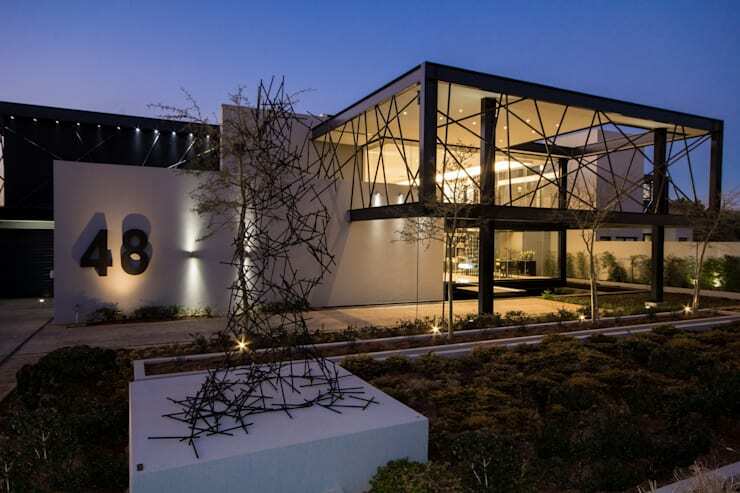 We can also see how the designers have played with geometric lines and shapes, both in the form of the sculpture in the front garden and the burglar bars of the home. Large, glass windows dominate the facade, creating a seamless transition between the interior and exterior spaces. 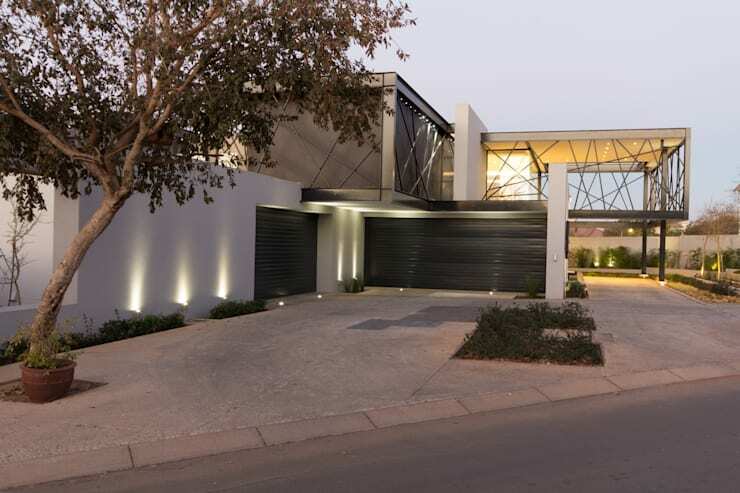 The designers have built two double garages, which allow the home owners to keep cars, bicycles and other items neatly stored away. These can be easily accessed from the road. A garage is an important part of a dream home, especially for Canadians. We want our cars to be protected from all weather conditions. The black and white facade is softened by the beautiful front garden of the home. The entrance to the home is as modern as it is magnificent. 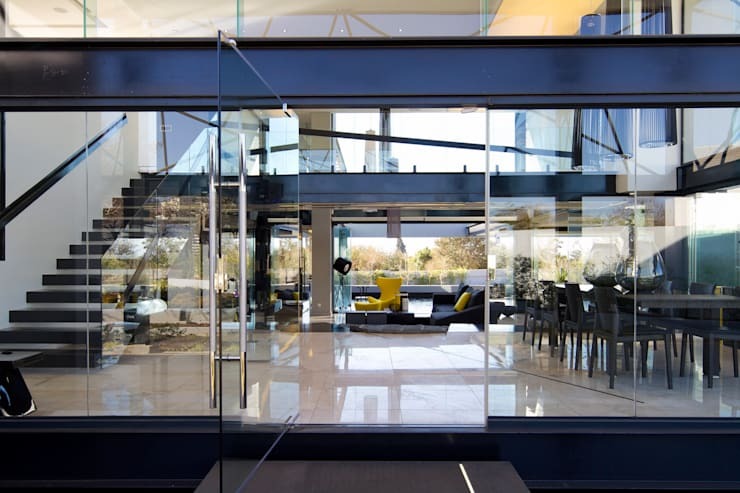 Large glass doors sweep visitors and guests into its depths, while allow for panoramic views of the open plan living area. The white and black tones persist throughout the interior space, with dashes of yellow bringing charm and warmth to the look and feel. Thanks to the large glass windows and doors, we can also see how natural light flows through the home, creating a very appealing interior space. 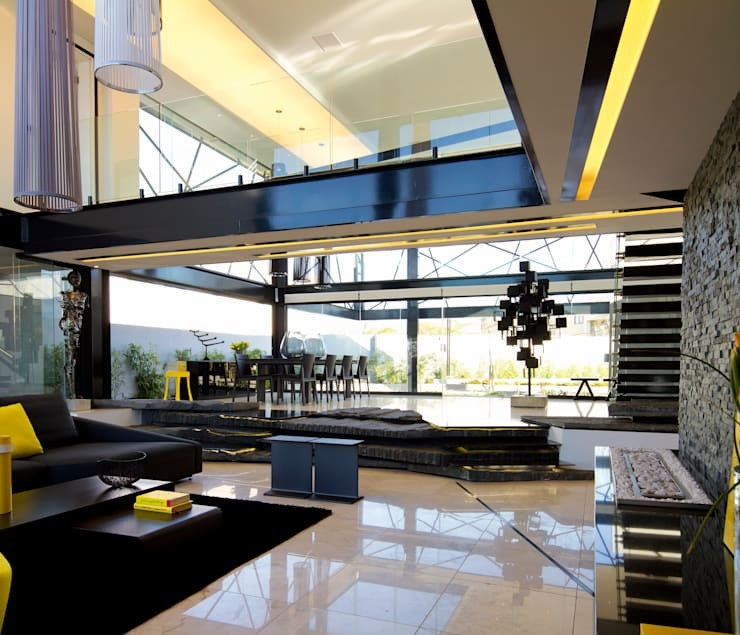 From the inside of the living area, we can see how shape and volume have been played with, resulting in a very innovative and cutting-edge home. The black furniture used throughout the dining and living rooms work beautifully with the white floors and expansive spaces. Don't you love the addition of the tree to the interior decor, connecting the futuristic modern interiors with the natural outdoors? Yet what we can also tell from this image is how comfortable and appealing this home is. It's the perfect combination of trend and homeliness. We can't explore this home without exploring the large swimming pool. The entire interior living space opens up onto the swimming pool, which provides hours of entertainment for family and friends. The lack of boundaries between inside and outside spaces is also apparent here, making for a very beautiful design. The large glass windows and doors ensure that even when the doors are closed, the inside space feels like it could be outside and vice-versa. A spacious terrace on the left allows the family to enjoy the outdoors in comfort and style. Have you ever seen something so extraordinary? 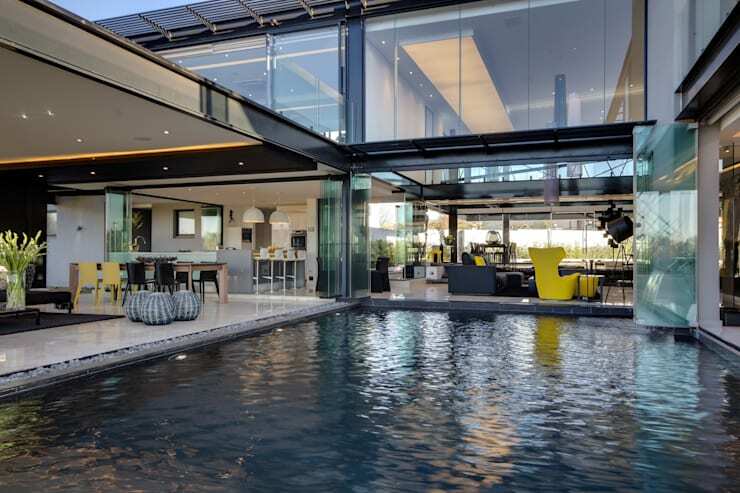 The upper level of the home mirrors the lower level of the home, with its own swimming pool and terrace. 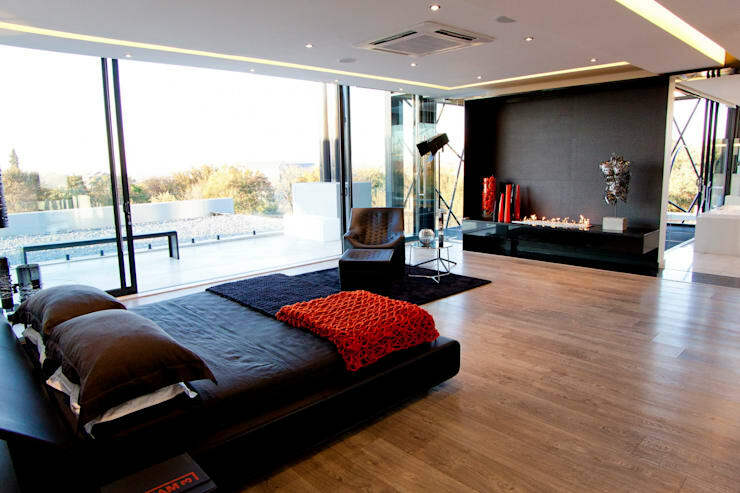 However this is a smaller and slightly more private area of the home, spilling out from the bedrooms. This angle really gives us a sense of how shapes, levels and boundaries have been explored in this exquisite architecture. The kitchen in the home is a wonderful example of how less is more. The black and white tones work beautifully for this space, while the kitchen bar creates a more casual area where family and friends can gather around a casual breakfast or a cup of tea. 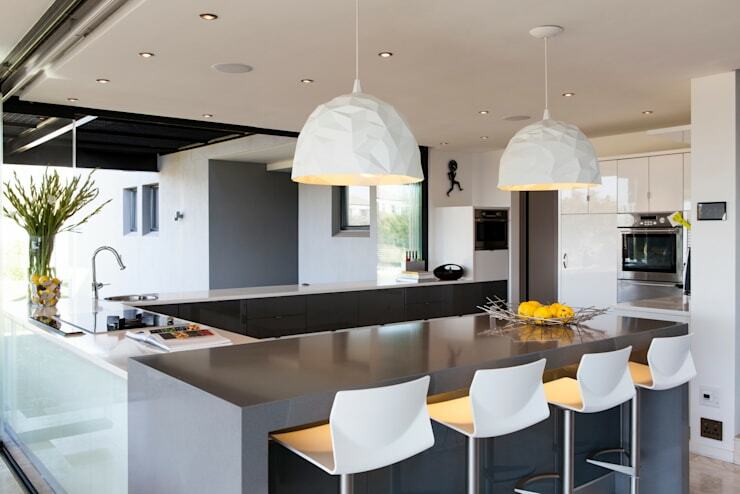 Don't you love the white lampshades, which hang over the breakfast bar, bringing functionality, light and trend to the space? The bedrooms in the home are just as gorgeous as the living areas, featuring the same neutral tones with a splash of colour. Here we come across a mix of brown and black, which creates a very warm and soothing environment. The touches of red throughout enhance the charm and appeal. The designers could afford to use dark tones in this space because of the amount of natural light that flows through the large windows and doors. Have a look at this article: Dark colours in small rooms? Give it a try! We end off our tour in this savvy bathroom, with its sophisticated and modern white features as well as its panoramic views of the surrounds. A bathroom is meant to feel serene and peaceful, preparing you for the day ahead or soothing you after a long day at work. In this design, the architects have managed to achieve exactly that. 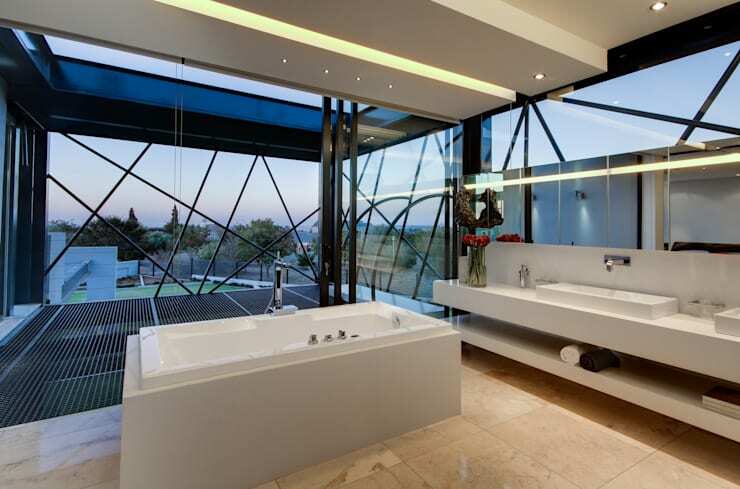 If you have beautiful views around your home, incorporate them into your bathroom design. It will give this space its own, natural form of artwork. If you've enjoyed this article, you'll love this one too: The home where island dreams come true. Are you impressed with this dream house?